Gold hoops are a staple item in almost every jewelry collection. While the signature gold hoop is classic – this Fall try a hoop with a twist. Whether it be more complex like these interlocking hoops or a bit simpler, yet unique like the Georgia hoop. This is an easy way to keep up with the trends this season, but without breaking the bank. The intentional mismatched earring was definitely a reoccurring theme during 2018 NYFW. Whether you pair a chandelier earring with a smaller stud, or just two completely different geometric pieces, the mismatched earring is bold and achievable look this Fall. The versatility of these interchangeable earrings allows you to mix and match as you please, you can play with colors and shapes to build a look you love! If you are looking to bring some of that summer color into the new season, multi-colored gemstones are the way to go. This could be in a bracelet, earrings or a single stone ring – the small pop of color is a fun trend that takes little effort. This isn’t your Dad’s gold chain from the 80’s, think chunkier and timeless. The chain-link style is making another comeback and can be worn to add a little edginess or some much needed dimension to your look. Designers like Balenciaga and Alexander Wang showcased chain-links in different styles of jewelry during NYFW – but we love the chunky chain necklace as a statement piece. The more the merrier – especially when it comes to Stella and Dot jewelry parties. Layering jewelry, especially necklaces allows you to play with different metals, colors and lengths to create an effortless statement piece. You could always keep it more toned down by wearing an already layered piece, or ask your Stella and Dot Stylist to help you combine different delicates to create your own look. Trying to keep up with the trends can often be intimidating, but with Stella and Dot there is no need to worry. With so many different styles trending this Fall, you can take what you like and make it yours! 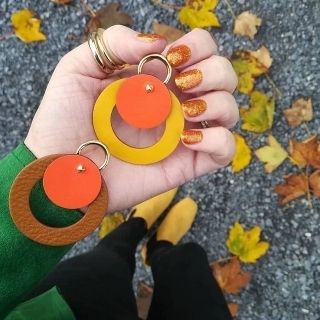 If you are still unsure of what to pick out for Fall – just ask your Stella and Dot Stylist, they will always know what is currently trending and how to best style it! What is your favorite trend to wear this Fall? Let us know in the comments!